Mount m!ka to surfaces of all kinds. 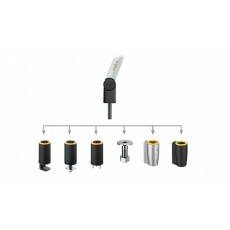 A broad range of mounting devices equips you with the right parts to mount your m!ka System in the best possible way. Thanks to different supports, m!ka Mic Arms and m!ka Studiolight can be attached to desks of different panel thickness, to m!ka System Walls or directly to your room walls. Enjoy even more flexibility by combining m!ka Mic Arms and m!ka Poles. The right accessories to mount m!ka in the best possible way. m!ka Arm Support offers you a choice of multiple ways to mount your m!ka Microphone Arms, m!ka EasyLift Monitor Arms and m!ka Studiolights. All of them are equipped with a bolt at their bottoms which can be used for our various plug-in mounts. Choose between different options to mount m!ka Arms to your desk, wall, m!ka Pole or m!ka System Wall.